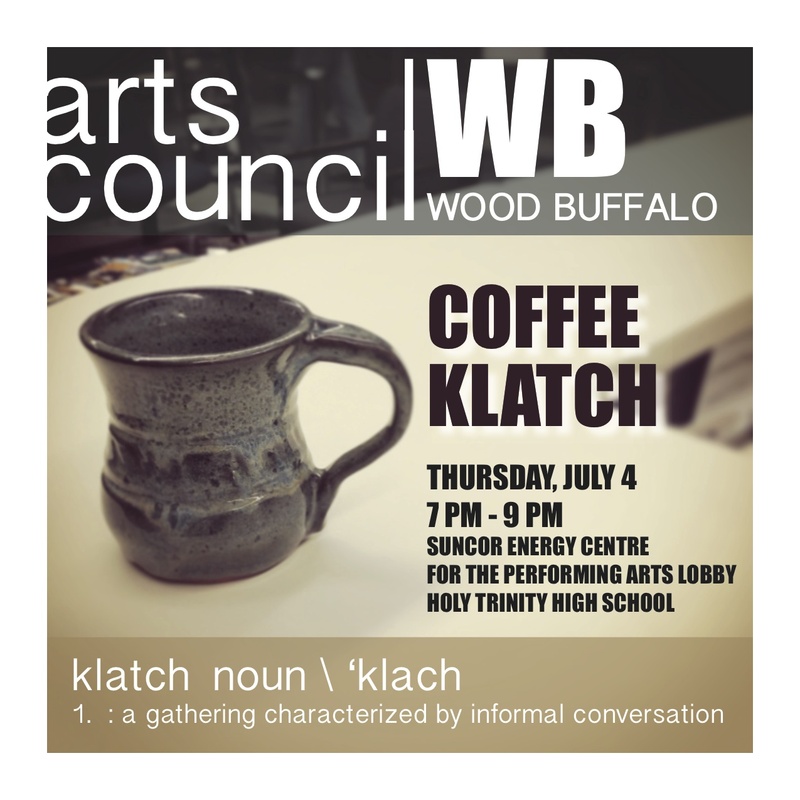 We've had a number of deep conversations about the arts and the work that lies ahead for Arts Council Wood Buffalo, including the most recent one last night at the Suncor Energy Centre for the Performing Arts. 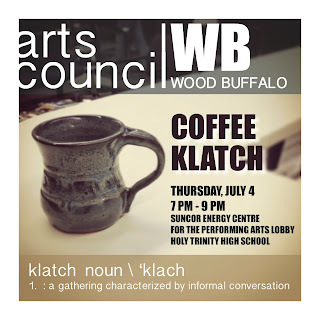 Our Coffee Klatches, gatherings for informal conversation, have proven to be a useful format to explore themes and dive deep into various issues and dreams surrounding the arts. And while it was a light turnout last night, being summer vacation time - we were eight souls strong - the discussion that ensued was amazing. This is the broadest, most prominent theme of all, with many sub-themes and ideas. But it is clear, from the perspective of all artistic disciplines, that having space to do what we do is very important. On the visual art side, there is a need for studio space, with one suggestion of a communal type of environment with room to dry and store canvases (and other creations) and safely store equipment. As it stands now, many artists are forced to cart their supplies to and from temporary spaces. It's difficult and awkward. "Sticking a wet canvas in the back seat of the car is just wrong," said one artist at last night's gathering. Artists are keenly interested in meeting and creating with other artists. Film folk want to engage with musicians; musicians want to meet poets; photographers want to collide with dancers; and theatre artists want to meet everybody. Collaborations and connections are happening, but they are random and elusive. A grassroots oriented community art centre would allow for these creative collisions to happen with greater frequency, in larger numbers and with more potential impact. If you're a visual artist, where can you get supplies in Fort McMurray? You can't. We do not have an arts supply store, and what you can get at Walmart or other retailers is sparse and of a quality that isn't going to help the growing number of serious artists that we have living and working in the region. 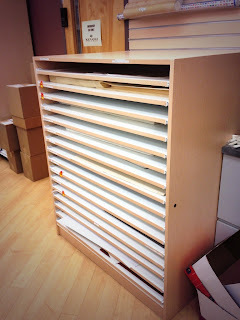 For the record, as it deserves pointing out, the Keyano College Book Store has an impressive collection of large format art papers (pictured above), if that is on your shopping list. I discovered that this morning after going for a walk to the other end of the Clearwater Campus - I work in an office in the Keyano Arts Centre. Spotlight Performance Wear, a dance supply business run by our friend and neighbour Sheila Sutton, is providing an essential service to a dance community that keeps getting larger and larger with each passing year. But with enormous lease costs, it's difficult to eek out a living. Before Sheila jumped into the business, parents would have to travel south, order stuff in, or wait for companies from the big cities to make their infrequent visits to our community with product. On the music side, we've been blessed to have Campbell's Music as a well-stocked, managed and staffed business for many years. It's my son's favourite store in Fort McMurray, bar none. But with declining band participation numbers in the school systems, we should never take this business with "big city prices and small town service" for granted. In the realm of "wouldn't it be great if...", we threw out the idea of integrating artistic retail space opportunities into new creative space projects or in existing facilities. Wouldn't it be great if you could walk out of the dance studio after blowing out your ballet slippers and right into a store that sells new ones? Imagine what it would be like for visual artists who run out of Titanium White in the middle of a project to be able to walk down the hall to pick up a fresh supply. I'm hearing a lot of pent up frustration from arts educators at all levels of the system: elementary, junior high, high school, and post-secondary. These individuals - there are no exceptions - are incredibly passionate about the value of the arts in our community and the role that arts education plays. From an ever-expanding menu of elective offerings, to the emergence of academies within the school systems that demand so much of the students' free time, numbers in several artistic disciplines are plummeting. To have band numbers in single digits in a school with a population of over a thousand is a sin. I came from a small town of only a couple of thousand people, and our senior band, one of the best in the province, was over 100-members strong. Why has the artistic thread through our education system been cut in so many places and how do we put it back together? Personally, I think the answers are within our reach, but none of us are going to solve it in isolation. We need to leverage our collective intelligence and passion to inspire the changes we seek to re-ignite the essential place that the arts need to have within the local learning continuum. 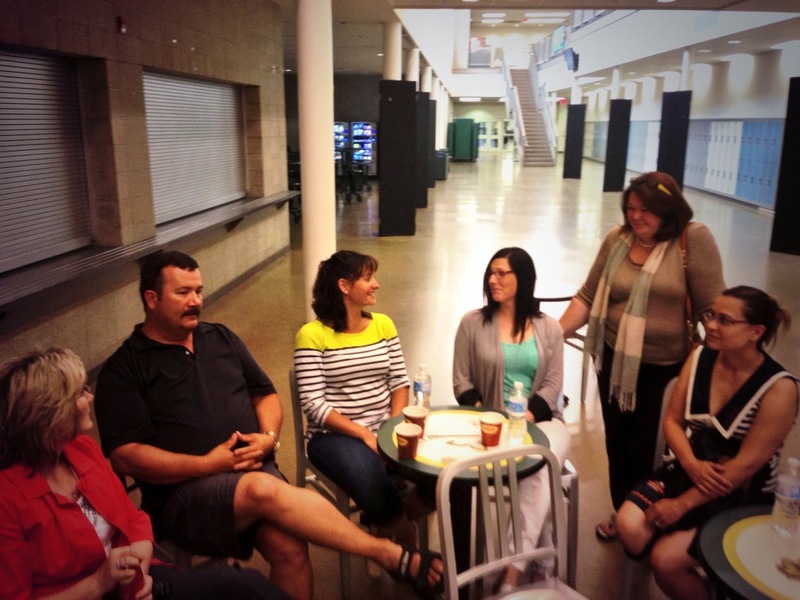 We are a community and region that is churning and bubbling constantly. Based on the most recent rental vacancy numbers, which have dropped from 10.8% to 2.8% in the last year, people are moving here from all over God's green acre, people who bring with them talents, artistic passions and potential. How can we connect and collaborate with these remarkable people sooner? How do we create collision opportunities on a more regular basis? Part of the solution to this ongoing dilemma is rooted in space, a place where creators can gather, share, work, rehearse, and collaborate. Another solution was suggested by a colleague of mine regarding the idea of an artist registry, a place online where an artist, new to town, can check-in, let everyone know they have arrived, what they bring to the table, and how to get in touch with them. Almost every day I meet someone new that possesses an acuity or artistic skill that surprises me. Mike Durocher, a long-time arts supporter, educator and musician, was describing the world-class players that are in our region, working in various places, including the oil sands mines, that would shock most people. I believe him, as I've seen so much evidence of the percolating presence of the creative class around every corner. Once again, I am going to quote my learned Council colleague Allan Vinni who once said "that the only mistake that we can possibly make is to dream too small." This Wood Buffalo truism applies to the arts community just as surely as it does anything else. And while we might initially think that having a Fort McMurray Symphony Orchestra is the stuff of dreams, we really shouldn't limit ourselves. Red Deer, a community just slightly larger than our own, has a wonderful symphony. Why shouldn't we have one? Why shouldn't we have an opera company, or a poet laureate? Perhaps I'm an overly optimistic person, but I have seen too many wild and unfathomable dreams become reality in this amazing place: winning the 2015 Western Canada Summer Games bid, having the most successful United Way campaign in the country, hosting KISS, delivering the Northern Classic, and announcing the most northerly CFL game in history. I desire the same for our arts dreams and believe that - in the words of the gospel song at the end of Act One of Hometown...The Musical! - "All things are possible." Call me crazy.